Do you remember Mel Gibson’s cinematic portrayal of The Passion of the Christ? I was in my first call when it came out and went to see it at our town theater with several parishioners. 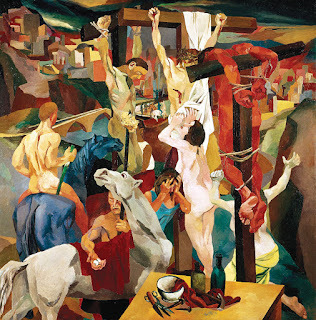 Ordinarily crucifixion was a torturously slow way to kill someone; scientists theorize that in some cases people died from thirst or exposure after days of hanging, suffering, a spectacle for all to see. But Jesus died in just a few hours. While my father may have found something edifying in the Passion film, my mother refused to see it. She has said that she doesn’t need to attend films that visually represent the events of Jesus’ last week because just reading the Gospels, or listening to the Gospels read aloud, shakes her and brings her to tears every time. Does that ever happen for you? Even a little bit? Whipped, such brutal punishment – portrayed in excess in the Passion of Christ film. By the time we reach the passion story in each of the Gospels, the reading or listening becomes heavy and painful. Have you noticed that everything seems bigger or longer, perhaps even more intense, in the Gospel of John? Whereas other Gospels play out Jesus’ interactions with Pilate in three simple scenes, John offers us a long, complex set of interactions in which Pilate shuffles back and forth between the Jewish religious and political leaders and Jesus, covering two chapters and lots of verses. The tale John tells of Pilate and Jesus is an intriguing one. If we take it at surface value, it would seem that Pilate did not want to crucify our Lord, but gave in under the pressure of those accusing Jesus. However, historical records suggest that Pilate was rather ruthless. So this weak and fearful portrayal seems inconsistent with the picture history paints. Is it possible to hear sarcasm in his voice? Might he be playing with them? Inciting them? In particular, it seems he might have been seizing this opportunity to gain loyalty to Rome. Whoa! Perhaps you have missed the weight of this before now. Here they were, in Jerusalem, a day before the Passover was to begin, rapidly approaching the hour when the lambs for the festival would be ritually slaughtered, and among the chants of faithful Jews in Passover celebrations, “We have no king but Yahweh!” We have no king but the God revealed to Moses. We have no king but God. For Jewish religious leaders to claim the emperor as their sole king, on this day of all days, is shocking. My stomach sank when I read it. Those words were a great betrayal of their deep loyalty to their God. So it sure seems to me that they were taunted and set-up and led to this betrayal. In how many ways was Jesus, this troublesome teacher, this disappointing leader, this passive and weak victim, pranced before the people and called their king? How distressing must it have been for this occupied people to see a bloodied body wrapped in purple and crowned in thorns and called their king! It surely seems that the Romans were making a mockery of the Jews in this moment and that all this talk of kings pushed them to their radical and distressing betrayal. That said, our painful Gospel stories suggest that the crowds that cheered for Jesus upon his triumphal entry into Jerusalem called for his death not a week later. It seems that just about everyone who crossed his path played a part in his undoing, and the betrayal that the religious authorities ultimately make gives us pause and offers us an invitation to self-examination. As we consider the willingness of the chief priests to forsake their radical allegiance to God alone, we are invited to consider to whom we pay allegiance, in whom we trust, or in what. Can we say that God alone is our king? Or is cash our king? Or a particular political party or candidate? Or your ego? Or a cause? Or any person here on earth? On whom or what do you rely? In particular, do you rely on the God revealed in Jesus Christ, that king who was self-sacrificing and vulnerable, that king who associated with “the least of these” and brought scandal to the elite, that king who ruled by love and justice, that king who gave his life for us? Or do you tend to imagine a warrior God, an invulnerable, all powerful, conquering king who looks little like Jesus? 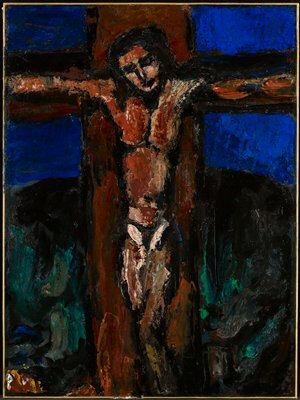 In the First Letter to the Corinthians, the apostle Paul wrote, “For Jews demand signs and Greeks desire wisdom, but we proclaim Christ crucified, a stumbling block to Jews and foolishness to Gentiles.” Even still today we can turn away from the cross of Christ, not seeing there the strength and honor we believe the one on whom we rely should possess. But our king is enthroned on a cross. Our king made known his power through ultimate weakness. Our king’s glory was revealed in this most unusual way. 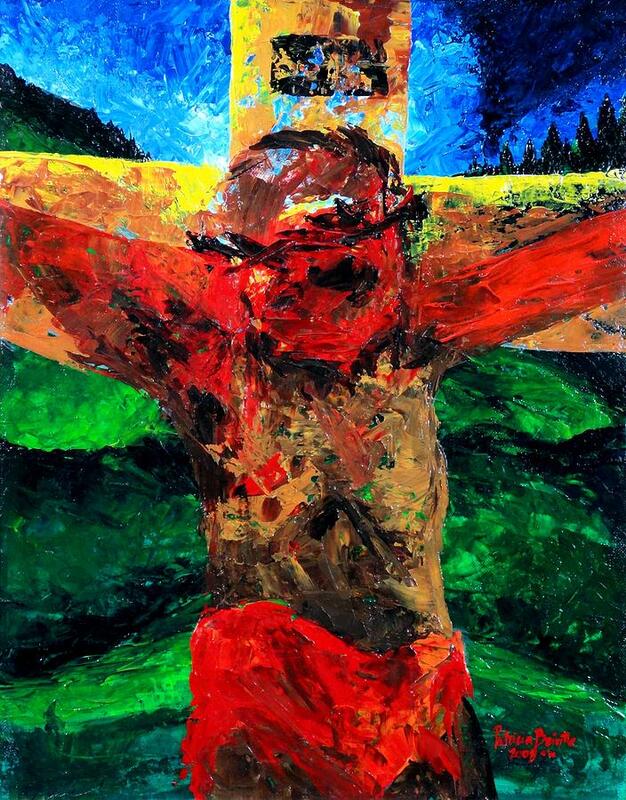 When I was just beginning to think about becoming a pastor, a fellow college student also discerning a call to ministry prayed for me, prayed over me, that I might get in touch with the crucified Christ. I found this prayer offensive. I preferred to reflect on the resurrected Christ – or Christ the teacher and healer… Why should I dwell on his unjust, brutal death? The cross, it seems, was a stumbling block for me. I feel differently now. This is central to Jesus’ story, one of the only parts of Jesus’ story that all the Gospels agree on. It is the part of Jesus’ story that suggests to us that God understands, from the inside, the depths of suffering, pain, and God-forsakenness human beings can experience. God is not a stranger to our pain, and God does not let the story end with pain. Resurrection means so much more after crucifixion. 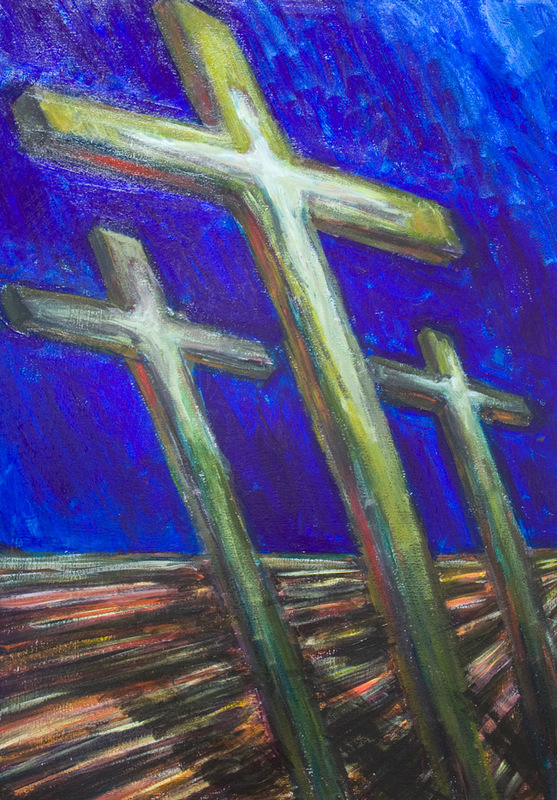 Once again, in Good Friday liturgies around the world this year, the faithful will make their way in procession to the Cross in an act of identification and devotion. For some worshipers, it feels particularly uncomfortable to do so, to show affection to an inanimate object – many of us cease such behavior after childhood. Yet, there’s value in publicly humbling ourselves, taking a moment to truly reflect on and connect with this instrument of Jesus’ humiliation and death, value in connecting with – identifying with – the crucified Christ. Whether those in earshot of your preaching have or take the opportunity to process to the cross this year, invite your listeners to find a way to connect with the crucified Christ. May that allow them to, in these days of Christian Passover, forsake their loyalty to all the emperors of this world, and renew their commitment to the crucified and risen Christ lifted up, the only true King and Lord. 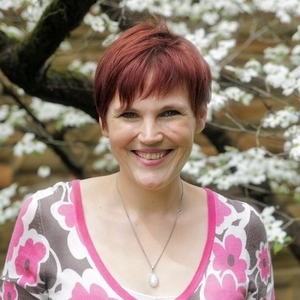 Sarah Sanderson-Doughty is Pastor and Head of Staff of St. Andrew’s Presbyterian Church, Portland, Oregon. She earned her Ph.D. in Theological Studies at Vanderbilt University. Sarah, her husband, Kevin, and their daughter, Caroline, love board games, exploring nature, and sharing great food with people. 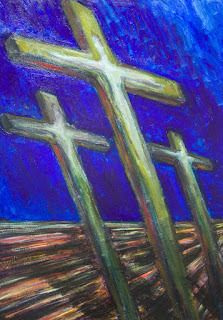 “The Three Crosses,” 2011, by Kazuya Akimoto. “The Crucifixion,” early 1920’s, by Georges Rouault.